Based on a poem of the same name, Ty Richardson’s emotive film War Poem follows a brother and his wounded sister as they escape their war-torn city in search of a place of peace. Commissioned by Minneapolis-based non-profit Motionpoems for their eighth season of shorts and making its online premiere on Directors Notes today, I spoke to Ty about creating this empathic, fictionalised version of a refugee crisis as experienced through Western eyes. How did you first get involved with the Motionopoems project? I was first made aware of Motionpoems by a director friend of mine who made a film for the seventh season. The producer of that short, Claire McGirr, went on to become the Executive Producer of the eighth and current season. I saw her at an event while she was still sourcing filmmakers and I jumped at the opportunity to put together a treatment. The production company behind War Poem — The Mill — also has a history with Motionpoems. They’ve provided animation, VFX, and colour grading services for a number of Motionpoem projects over the years. Plus they were responsible for entirely creating Wayne the Stegosaurus, an animated Motionpoem that has seen a lot of success for the non-profit. Of the poems made available to you, what was it about Nomi Stone’s piece that made you want to depict its themes on screen? How much input did she have into the film? As a predominantly narrative-driven filmmaker, I knew from the beginning that I wanted to create a film with tangible story elements; perhaps informed by a central character, a suggestion of conflict, or some sort of resolution. I’m no poetry scholar myself, so I figured I’d lean into that and find a poem that could be translated into an accessible film for a broader audience. That said, I still appreciate poetry’s innate mystery and the beauty of language itself. Nomi Stone’s War Poem checked all these boxes. The writing is haunting and powerful, yet there are lines in there that immediately trigger the imagination and reckon with a bigger story. I decided to let the first half of the poem remain abstract — serving the film as a tonal voiceover that sets the mood — while the second half of the poem became a loose script, around which we structured the rest of the short. I didn’t want to just make a 1:1 visualization of the poem, but I certainly wanted to respect and maintain the original intent. I spoke with Nomi a couple times during the creative development phase. She was instrumental in helping define the ‘takeaway’ of the poem and film. My first version of the script proved to be more hopeful and heroic, which, after speaking with Nomi, I came to realize was not really aligned with her original intention. Again, I didn’t want to just make a 1:1 visualization of the poem, but I certainly wanted to respect and maintain the original intent. The intrinsic nature of poems leaves them open to interpretation, how did you establish the visuals you wanted to capture for this piece. Halfway through the poem, there’s a line that reads, “But she falls and cannot walk, so he carries her.” This is arguably the line that drove home my interest in the poem. It’s evocative and physical and became the North Star of the story. We structured the film around this singular moment and deepened the narrative through backstory. The visual storytelling ultimately came together in the edit. As a whole, I’d classify War Poem as a non-linear film, but the edit is actually fairly simple. It’s two storylines: the ‘carrying scene’ as we called it, intercut with a series of vignettes that build towards this moment of despair. The latter is not necessarily driven by the source material, but rather a choice to let the film say something of its own. Could you tell us more about the process of shooting War Poem? Sure. We shot the film over three days using the RED Epic Dragon. My DP, Adam Carboni, is something of a wizard. He comes from a documentary-style sensibility, so his ability to toss the camera on his shoulder, insert himself into a scene, and shoot loads of coverage is second-to-none. In fact, a lot of the film is handheld, which I think really contributes to a sense of truthfulness. The ‘carrying scene’ was a Steadicam shoot, which, admittedly, was pretty fast and furious as we chased magic hour light. Otherwise, we had a great shoot in Upstate NY with a crew of less than 20. How did your association with The Mill enable you to expand your ambitions for the film? The Mill, specifically the live-action arm called Mill+, was instrumental in getting the film made. Not only did some of the senior creatives help develop my initial ideas, the sheer scale and breadth of The Mill allowed us to take the film to the next level. We tapped into The Mill’s stock of equipment, crew, and other resources. Producer Tia Perkins took charge of the show and allowed me to focus on directing. If not for Tia and everyone’s enthusiasm to be involved in the project, I’m not sure how we would’ve made something within the same scope as this. After we shot, we tapped The Mill’s legendary visual effects capabilities to create a smoking — and then burning — city skyline. Using a matte painting and a blend of 2D and 3D effects, the entire city is digitally created. I’m so impressed by The Mill’s work here, especially whenever I go back and compare the original frame to the finished product. Unlike the oft disassociated news footage we see, War Poem presents a Westernized version of the refugee crisis, what was the intention behind that decision? Are you hoping for audiences to take something in particular away from the film? Like every season of Motionpoems, this season has a central theme. This year’s theme is Dear Mr. President, so all of the works touch on topical and relevant issues, such as climate change, immigration, or racial inequity. A number of these themes are open to interpretation and can sometimes only be extrapolated if you’re looking for them. I think poet Nomi Stone ultimately helped me understand how her piece relates to the theme. It was listed under the ‘gun control’ category, but it’s really about war vs. peace in general, and the toll that such unrest can take on a grounded level. In fact, Nomi’s poem is based on real events that she witnessed while living and studying in the Middle East. As you said, I think it’s true that a large part of Westernized culture has a limited worldview, often exclusively informed by what we see in distant depictions via the media. It starts to normalize, and what we’re left with is a marginal awareness of anything not in our backyards. I’m guilty of it myself. So when I was working on the treatment, I started reading individual accounts from a number of Syrian refugees. I remember one of them even made a heartbreaking iPhone documentary about her entire journey from Syria to Greece. I don’t think a seminal film about such a heavy and complex topic could be achieved in four and a half minutes. I was particularly affected by the stories of family separation and loss. At one point I came across a Pulitzer Prize-winning photograph depicting a father carrying his young son down a long road. Obviously, I found the parallel to be quite striking. I thought more about the Dear Mr. President angle on War Poem and wondered what a fictional, Westernized version of a refugee crisis might look like. Specifically, what it might look like to me. In that way, this is a version of that fictional crisis, not the version. I don’t think a seminal film about such a heavy and complex topic could be achieved in four and a half minutes, nor is this meant to be a complete summation of Western culture. Instead, we glimpse a slice of just one journey shared between siblings and rooted in what is personal and relatable to me. Inspired by the backdrop of those distant depictions, I think the ultimate message to the powers that be is, what if they weren’t so distant? How would your own life and circumstance change? I’m currently writing the script for my next short, which, unlike my last couple projects, is going to end up being pretty dialogue-heavy. I love working with performers, so I’m eager to explore that filmmaking tool again. 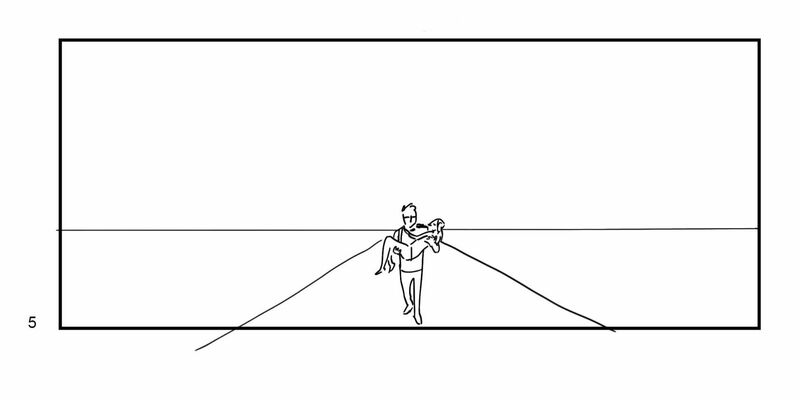 The short is actually a version of a scene from a feature script that I’ve been developing for a while now. Here’s hoping one thing leads to another and I can eventually tell the larger story.